All India Congress Committee (AICC) spokesperson Jaiveer Shergill lashed out at the Bharatiya Janata Party (BJP) Government at the Centre on Rafale deal here on Tuesday. 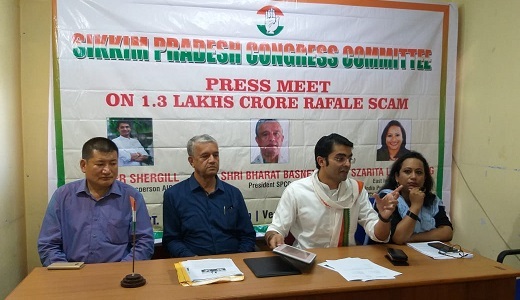 Shergill informed the media persons that the AICC has been holding 100 press conferences in 10 days across the country to expose the Rafale scam. The AICC spokesperson also alleged that the BJP Government has provided benefit to its corporate friend by paying much higher price from the taxpayers’ money in this deal. He also questioned on how the Government had given the deal to a corporate friend instead of the much experienced Hindustan Aeronautics Limited (HAL). He mentioned that the Congress party has been tagged as ‘anti-national’ by the BJP for asking questions on this deal. He further alleged that the central Government has “compromised with the national security” through this deal. He asserted that instead of providing benefit to its corporate friend, the money should be spent in the defence of the country. He alleged that BJP was not a ‘corruption-free’ party but it is an ‘investigation-free’ party. He demanded that BJP should conduct investigations into the matter. The press conference was also addressed by East India in-charge of All India Professional Congress & National media panellist, Szarita Laitphlang and Sikkim Pradesh Congress Committee president Bharat Basnet.